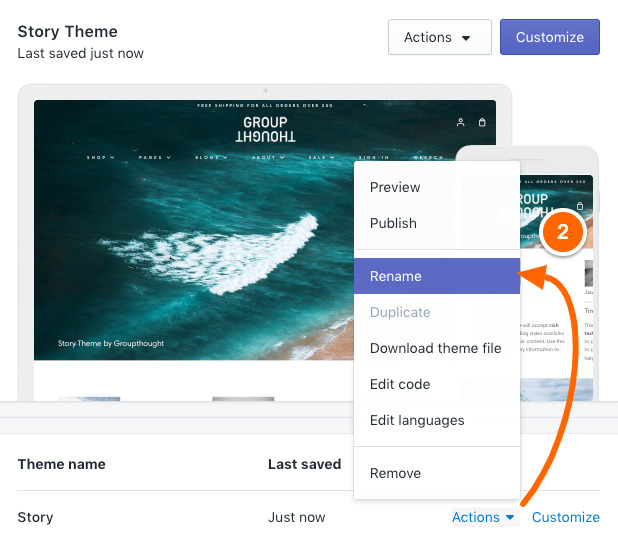 Here are some tips for migrating your settings and homepage sections when updating to the latest version of Story theme. In this step, you'll be downloading the latest version of Story from Shopify. Visit the Shopify Theme Store and log in. 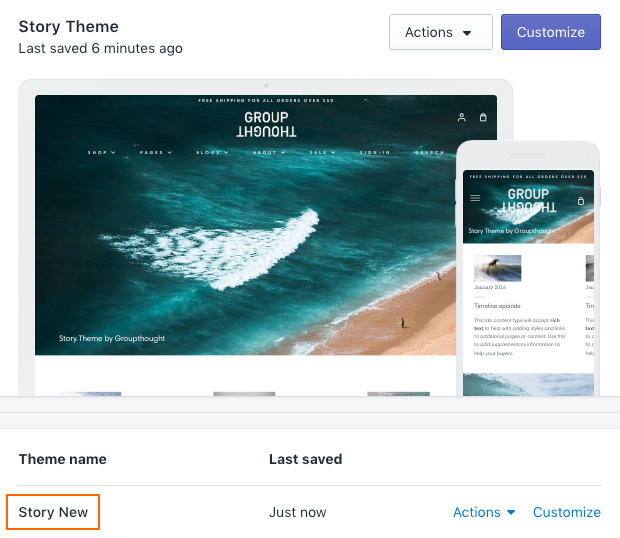 For paid themes, it is important to log in to the account that you used to buy the theme. This will prevent you from being asked to buy the theme again. Click Add latest theme version or Add theme. Tip: You must be logged-in to the account that purchased the original theme. 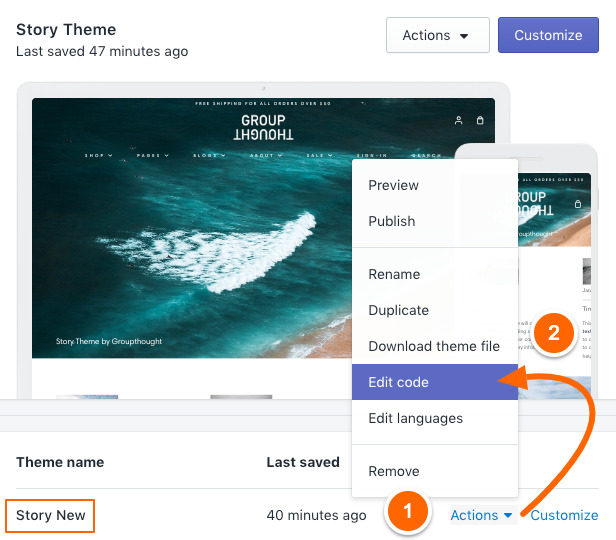 Rename the new theme to Story New. 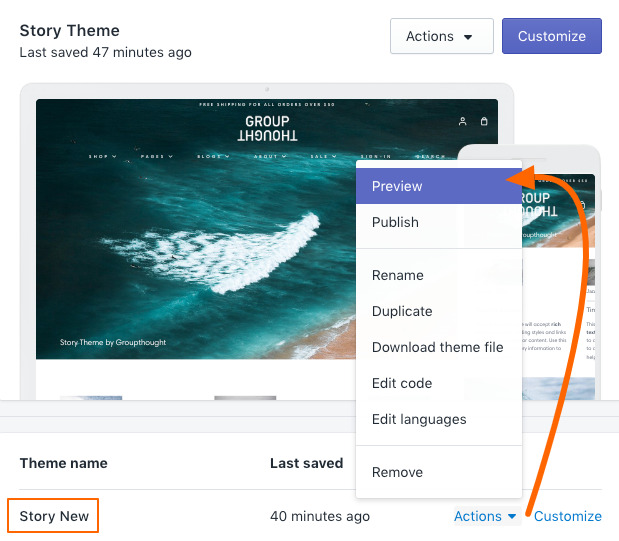 Renaming the theme will help identify the newer version while you setup the theme in the next step. 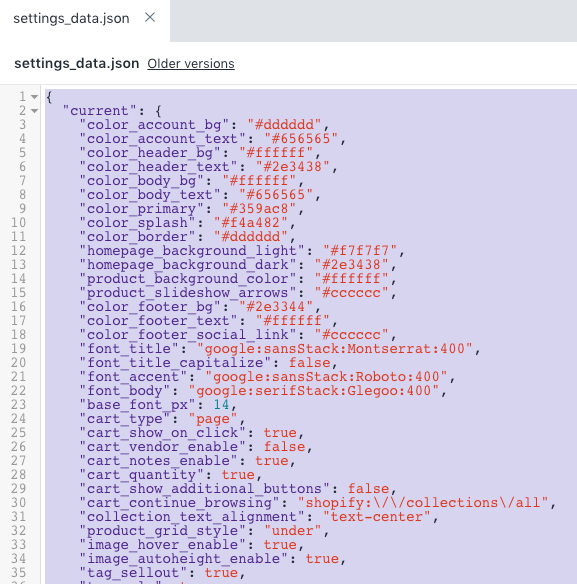 Click on the settings_data.json file to view the code. This file holds your hompepage sections, colors, fonts and other general settings. Use Command-A (Mac) or Control-A (Win) to select all, then Command-C (Mac) or Control-C (Win) to copy all the selected code. Return to the main Themes list. We will now edit code on the new version of Story. Be sure to open the right theme. Remember the top theme is your live theme and the themes below are your draft themes. 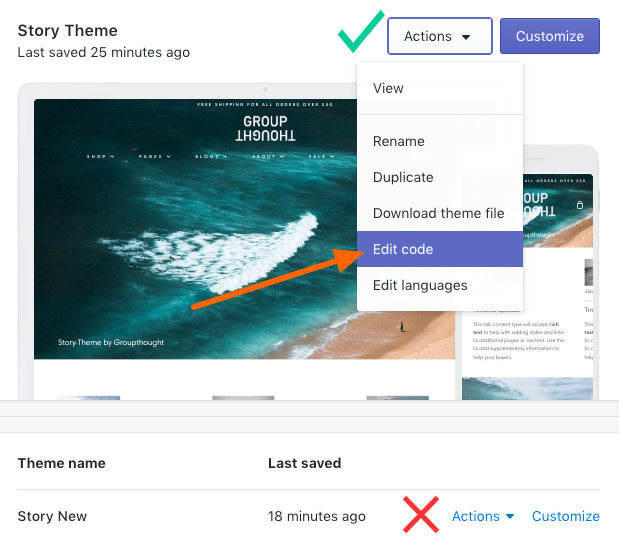 Important - Again, be sure you're working out of the new theme and not the one above which is your published/live theme. 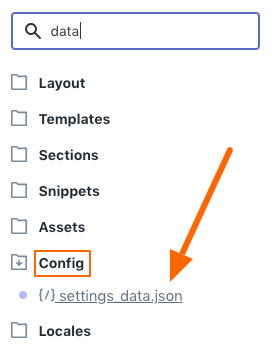 Click on settings_data.json in the Config folder to see the code. Next, replace all the code in this file from the code in Step 1. Then replace all the code by using paste (Command-V on Mac or Control-V in Win). Remember, we are copying from your live theme to the new draft theme. If you don't have the code from Step 1 in your clipboard, then go back to Step 1 to copy that code again from your live theme. This step is optional. 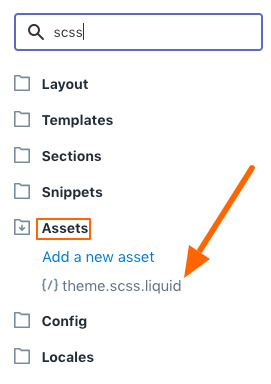 If you have been saving override CSS code at the bottom of your theme.scss.liquid file, you can easily copy those changes over to the new theme. Make sure you've scrolled to the bottom. If you have override CSS code here, you can copy certain elements from this lower section over to the new theme. Only copy over css overrides from the bottom. Do not copy all the CSS. Important: Be sure not to copy all the CSS from the old theme to the new theme - That will break your theme. Only copy the overrides that you might have added from tutorials (if they still apply). Open the draft theme, Story New and paste the override code at the bottom of that theme's theme.scss.liquid file. Paste only the override styles that you might need. Remember, do not copy over all the CSS from the old theme. Any code customizations you've done to your old/live them will need to be done manually to the new theme. Some apps will require these customizations so refer back to their installation instructions to integrate with the new theme. Paste the current code from your Live theme on the right side and then use the Older versions link and copy the code over the left side (Important - Don't save after using the Older versions link, just copy the code and then cancel). This will show you what's been added (green) and removed (red). It may help you with understanding the changes you made on your Live theme. 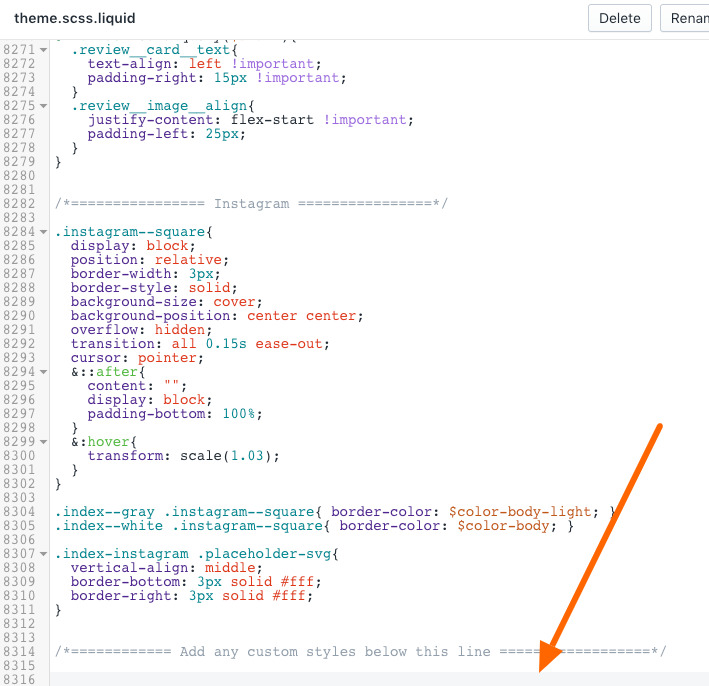 You can document those changes as reference when updating your custom code in the new theme.